The creators of Keyboard Cat and Nyan Cat claim Warner Bros. and 5th Cell infringed on their trademarks by including references to the memes as Easter eggs in Scribblenauts. On the off-chance that you joined the internet yesterday and are thus unfamiliar with the Keyboard Cat and Nyan Cat memes, I'll begin by providing links to entries for both at Know Your Meme. The rest of you already know that these are two of the most famous memes on the net, famous enough, in fact, to warrant appearances in the hit game Scribblenauts and its sequels. Alas, those appearances were unlicensed and unapproved, and that means it's time for a lawsuit. 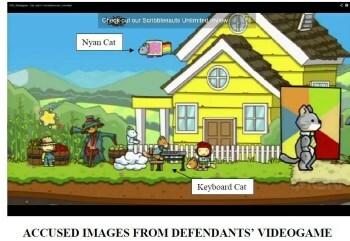 Charles Schmidt, the maker of Keyboard Cat, and Orlando Torres, the man behind Nyan Cat, have filed suit against 5th Cell Media and Warner Bros. Entertainment, the developer and publisher of the Scribblenauts games, claiming that neither authorized the use of their memes and seeking various damages, restitution profits, legal fees and all the rest of the usual. "'Keyboard Cat' and 'Nyan Cat' are known and enjoyed by tens of millions of people. That popularity makes them extremely valuable for commercial uses. Unlike WB and 5th, many other companies, respecting plaintiffs intellectual property rights, regularly pay substantial license fees to use plaintiffs' memes commercially," the lawsuit states. "For the past three years, WB, along with game developer 5th, have knowingly and intentionally infringed plaintiffs' copyrights and trademarks by using 'Nyan Cat' and [Keyboard Cat] Fatso's image in WB's top selling Scribblenauts games, including, most recently, Scribblenauts Unlimited, which WB released in 2011. Compounding their infringements, defendants have used 'Nyan Cat' and 'Keyboard Cat,' even identifying them by name, to promote and market their games, all without plaintiffs' permission and without any compensation to plaintiffs." Keyboard Cat and Nyan Cat aren't the only memes to make an appearance in Scribblenauts; the Scribblenauts Wiki lists more than 40 of them, including Rickroll, Ceiling Cat, Dramatic Chipmunk, Cool Story Bro and the classic All Your Base Are Belong To Us.